Having a solid cast headed by James Stewart with support by Josephine Hull, the film follows the life of a very pleasant man, Elwood P. Dowd, who befriends everyone he meets. 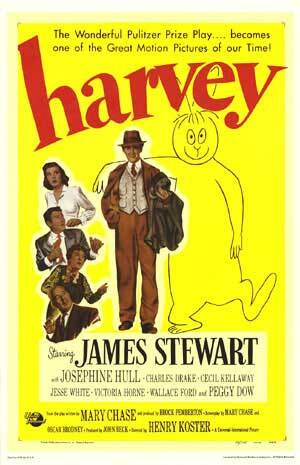 However, he has a major peculiarity in that his closest companion is a 6 foot 3 1/2 inch rabbit named Harvey. His loving but annoyed sister tries to get Dowd interned at the sanitarium. However, due to circumstances, things do not turn out as she planned. Along the way Dowd capivates and befriends many people with his simple charm. Rather then have her brother injected so he forgets Harvey, Hull’s character realizes he needs to stay the same. With everyone in a happy and content mood, Dowd walks off again with his best friend. Stewart is wonderful in this quirky role and overall the cast is very good. I have to say I was wary of this film based on the premise but after you get past the absurdity it really is enjoyable and it reels you in. This entry was posted in 1950s, Comedy, Fantasy and tagged Henry Koster, James Stewart, Josephine Hull, Peggy Dow by 4StarFilmFan. Bookmark the permalink.